Historical Marker For Lansky Bros. - Misc. 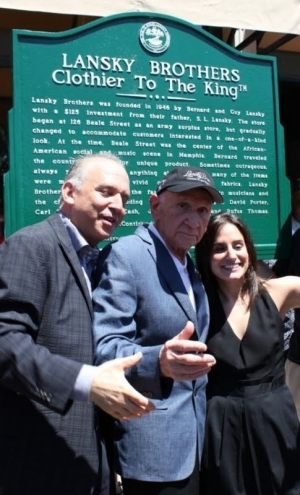 Historical Marker For Lansky Bros. The Lansky Bros. clothing store received a historical marker in front of the original location at 126 Beale Street. The marker tells the Lansky Bros. story and their connection with Elvis. The unveiling ceremony was attended by over a hundred people, including Bernard Lansky's grandchildren and 'Master of Ceremony' George Klein. Bernard Lansky attended the unveiling too, but did not speech. What a great honour for Bernard Lansky, I'm pleased it happened while he is still with us. Lansky Brothers certainly sold some very stylist clothes. Do we have to keep trashing Michael Jackson? I don't suppose his fans could care less what Elvis fans think or even know about this marker. There is room enough in this would for everybody.